So here is the beginning of the conversions and I have some Work in Progress photos of them and then a couple of shots of them completed. I will post another set of photos as they progress through painting and then when they are done I will do a video of the models so you can see the full color change paint effects. Here are the figures in the initial stages - as you can see you have essentially two choices for the backs of the figures from each set - the Cryptech figure choices come from the Deathmarks as they have a hood-like armor plate partially covering their head - and the Deathmark head works fine as a Cryptech head - as it is essentially a Lychguard head with one eye instead of two. I figured that I could cobble together some bits to make the new heads look more cryptech like. The Necron Lord figures come from the Lychguard box set and I've used some of the back plates from both the Lychguard and Triarch Praetorian figures to build up some nice and different bodies to become the Necron Lords. 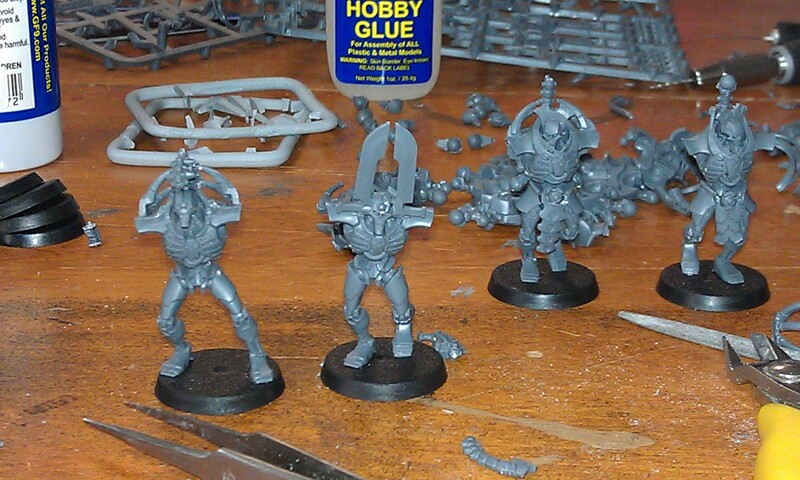 Also, I've used bits from the Triarch Praetorian box to make some different bodies for the Cryptechs. Above we have a close up of a Cryptech figure in progress - note that the Cryptech is kind of hunched over at the waist and he has an unusually large chin - I think he has more chins than two Chinese phone books - ok, enough Austin Powers humor. Above we have in the center another Cryptech conversion in the making - I've used the Triarch Praetorian back on the Immortal torso - a bit of a conversion - but it gives you a nice spinal column looking hood. 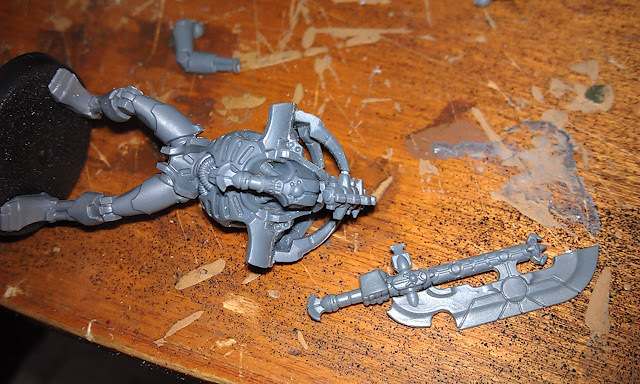 Next to him and below you have a Necron Lord conversion in process. I've added two of the Warscythe blades to the sides of his head and used one of the Triarch Praetorian heads to make a fearsome looking head-dress on a standard Triarch Praetorian torso and Immortal legs. 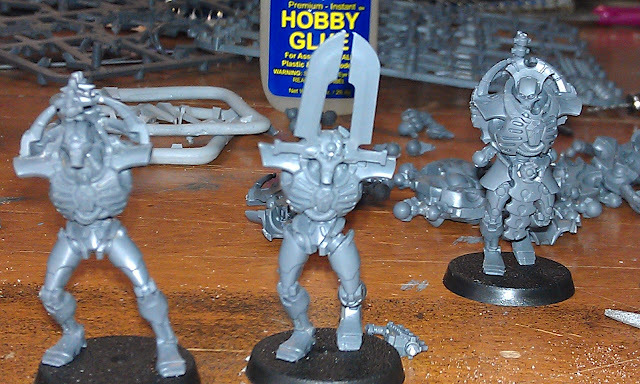 (note the Immortal/Deathmark legs do not have the large hip/thigh armor plates like the Lychguard/Triarch Praetorian models). Here we have the close up of the Necron Lord conversions in process - note the difference between the legs of the conversion in the center from those of the model at right above. The huge thigh guards make a noticeable difference from the legs of the Immortal. 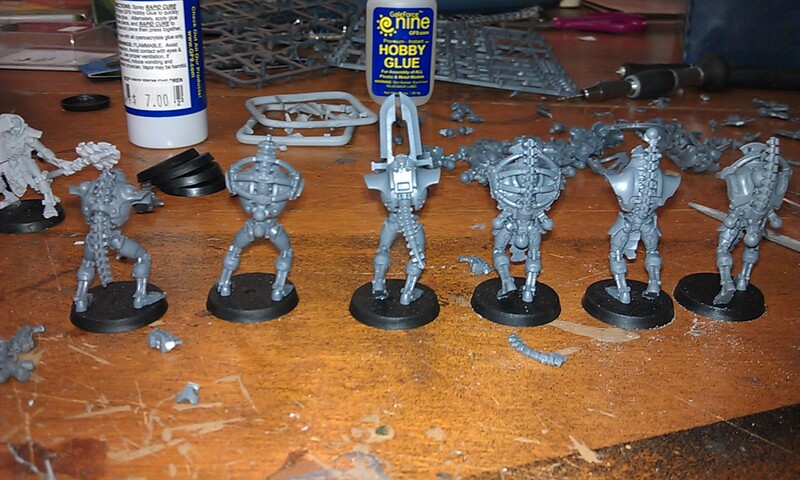 At right we have the Triarch Praetorian torso and legs with a Lychguard spinal column and head instead of the standard models. These simple changes make them distinct enough to become Lords. Another view of the workbench and the various parts and models in process of being completed. Thes two box sets give you loads of bits for conversion purposes and they will make a very nice Royal Court for about $66 for the full ten model compliment. Please note that I've also used some staves from another box of Lychguard which have the shields and swords options instead of the Triarch Rods of the Covenant. So, to get the full compliment you will need some extra parts - but then again if you have build any of the Elite choices in the new codex, you should have a few extra bits hanging around to work with on these types of conversions. 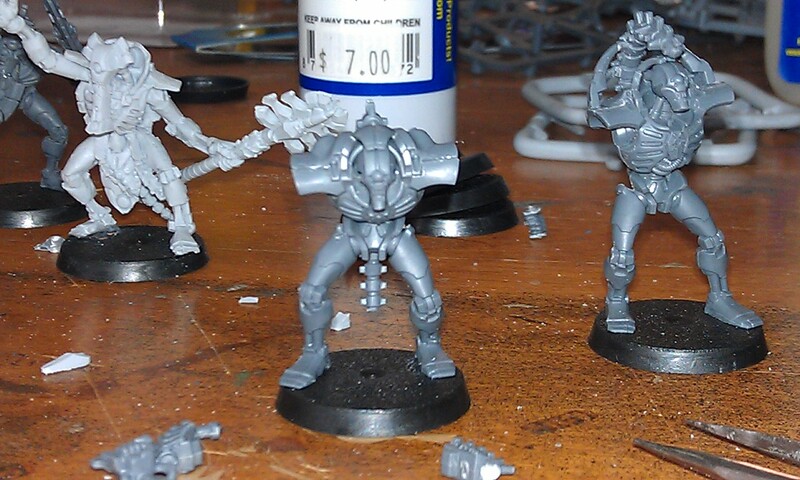 Above we have a close up of three of the Necron Lord conversions in process. 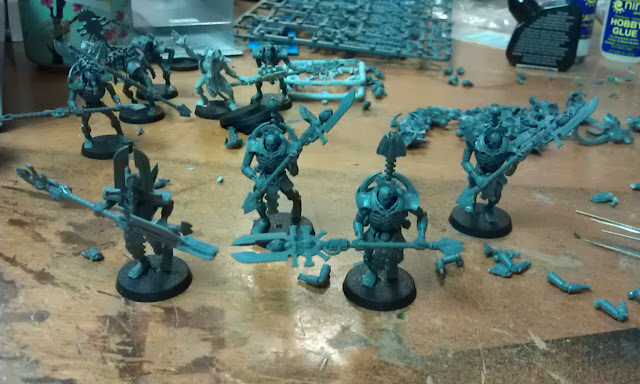 There are three Triarch Praetorian/Lychguard legs used, two Triarch torsos, one Lychguard torso, and all Lychguard heads, with Lychguard spines - which will be further modified. 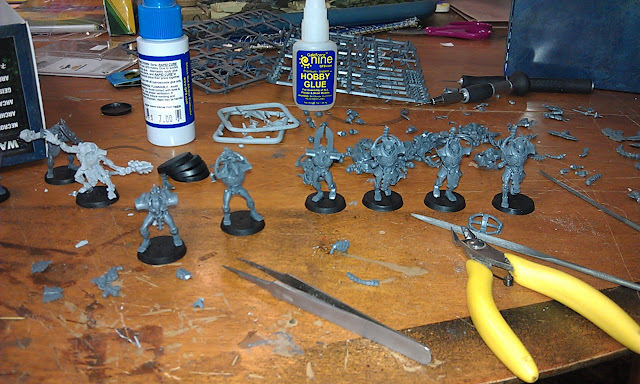 Here are the models from the back in partial conversion state - you can see the various modifications of the figures. The two on the left are the Cryptech conversions - note that they have been bent over at the waist as far as the model will permit to give them the hunched over pose. 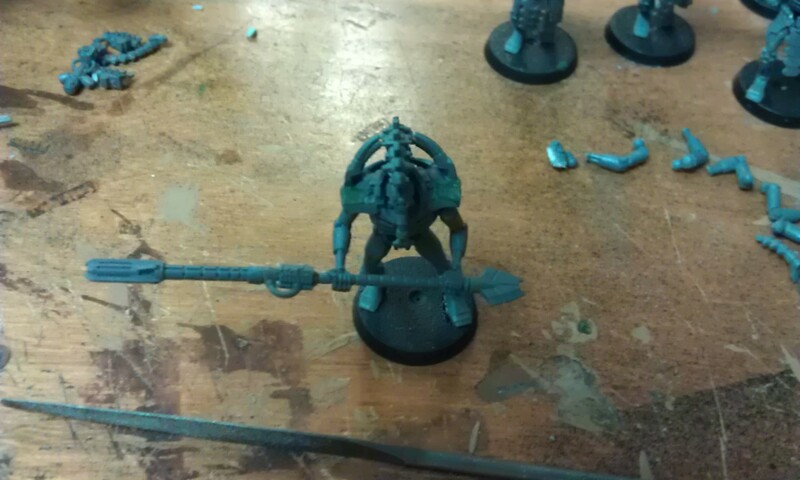 The Necron Lord conversions are all upright and use various bits to modify the back of the figure to make them distinct from a standard Triarch Praetorian or Lychguard model. Use your own creativity to modify the backs of your figures to make them distinct from standard models and you should have not problems using them in games. Okay, time for some bits removal and conversions. Above you can see the Cryptech conversion in process - I've removed the hilt from a sword and affixed it to the chin of the Deathmark model giving the new Cryptech a large chin protrusion - which makes him distinct and gives him an appearance similar to the GW Cryptech in Fine Cast. I think it also gives him a bit of a stylized chin not uncommon from those of the Pharaohs of Egypt. This is a simple conversion and theft of a bit from a model which can be done by anyone - feel free to see how it looks on your models. Another conversion of a Deatchmark head to create a distinct Cryptech looking head. 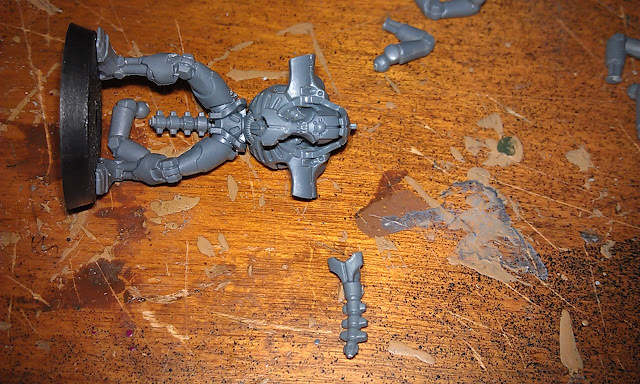 Here I've stolen the top of a spinal column/tail device and trimmed it up to add on a distinctive looking large chin device - not too bad and another easy conversion to make a model distinct. 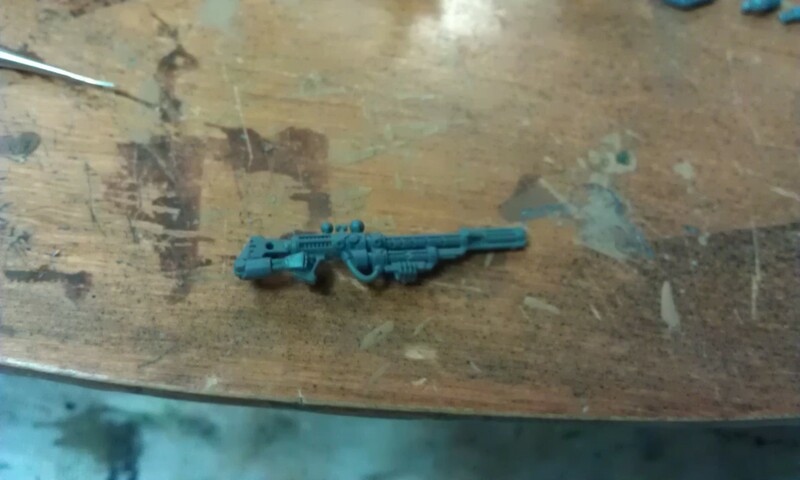 Here is the standard Deathmark sniper rifle as clipped from the spue to be used to create a Deathmark sniper model. However, that is not how we are going to use it in this conversion - it is going to become a Cryptech rod of destruction - one of the various types you can use in the special Cryptech models - and since there are various distinct types of Cryptech - it is only fitting that they have distinct rods/staves. Here we see the full effect on the nearly complete Cryptech model. The sniper barrel has been removed from the gun and drilled and pinned into place on the standard Rod of the Covenant/Warscythe hilt to make a distinct looking rod for our Cryptech. Makes him look a bit meanacing, we will have to see how the rest of my gaming group reacts to this figure when he is fully painted and ready to hit the tabletop! 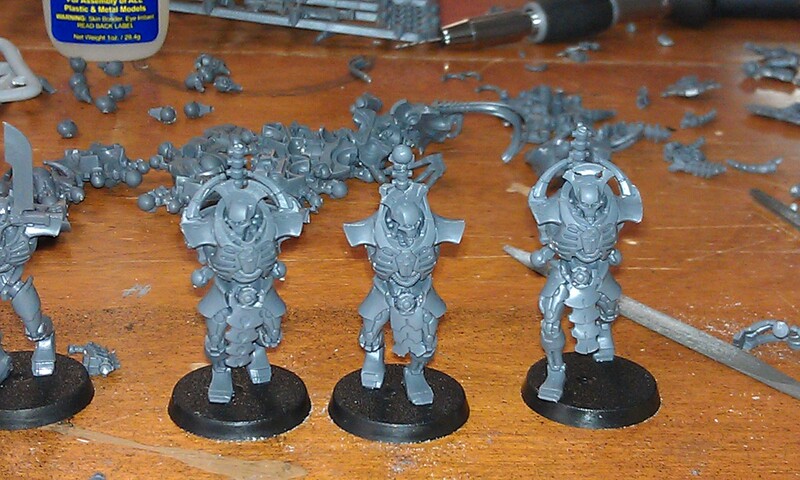 Here are the four new Necron Lord conversions now that they are complete - sorry I didn't take more photos of them in process, but I put the camera down and just went to work last night. On the far left we have the Lord with the special conversion head-dress and a special stave which is a custom Warscythe with a Rod of the Covenant on the other end - in game terms it is just another Warscythe, but in some of our "build a character" types of campaigns it will be something distinct and fun. 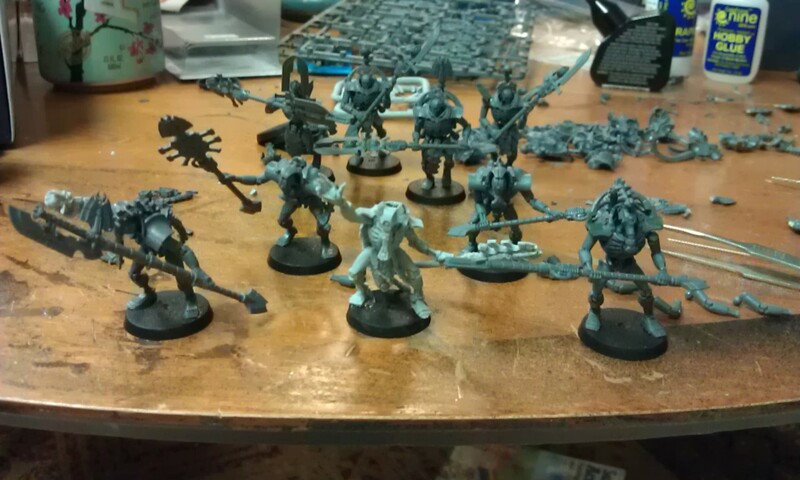 The model to the left of center in the back has a standard Warscythe with a converted bit on the weapon to make him distinct from the model at far right. 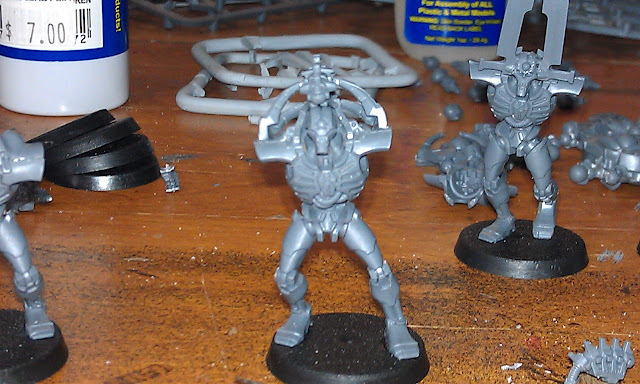 Both of these models also have large Resurrection Orbs on the top of the spinal column. The model at right in front also wields a custom double bladed Warscythe built upon a Rod of the Covenant with two blades from the standard Warscythe. He also has a decorative finial on his spinal column which comes from the top of a Rod of the Covenant trimmed down, filed and fitted to the top of the spine. Makes him distinct with a bit of a Samurai banner thing going on. We will see how he looks on the tabletop when he is all painted up and terrorizing the enemy troops! Above we have the five Cryptech models - the standard GW Cryptech in Fine Cast is center and you can see that with the other models mixed in they all look sufficiently like a Cryptech to make them a fine Royal Court for my Necron army - all that remains is to get them painted up and based to take the field against my opponents. I hope that those of you who are wondering what to do to create a Royal Court will find some inspirations here and you will take your own creative license from these models to create your distinct Royal Court - as the only way the rest of the Royal Court is going to come out will be Fine Cast - this is a very cost effective and nice method of making your own and it is all tournament legal (if that is your thing!). You may notice that there are two models missing - and the explanation is that they were already converted, assembled, primed and painted and featured in the color photos of my Necron army in the prior posts - I needed them ASAP for a game to add to my standard squads and give them a bit of a punch since running standard warriors under the new codex requires a few modifications of your standard old-codex army to make them a bit more resilient. I hope you all enjoyed this mini tutorial on conversions. It's my first - so enjoy. I haven't collected GW stuff for a long time (back when the necrons had their first re-birth in the form of a new codex and a few plastics kits) so its good to see what new stuff they've rolled out. I like the conversions, especially the 'sunken head' lord torsos and all their various gubbins. I do too, the new figures are very nice, and easy to assemble and yet filled with character. The newly re-envisioned Necrons have a completely new outlook which is rather nice instead of just "undead in space."